It was just a month ago, almost to the day, when the Twitterverse exploded with news that the lights went out during the Super Bowl game. 231,500 Tweets per Minute (TPM) to be exact. Okay, I admit the Beyoncé half-time show generated over 5 million Tweets, but Super Bowl XLVII will be remembered for its period of darkness, perhaps more so than the game itself. 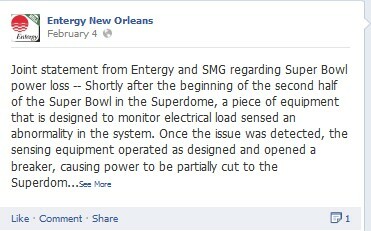 Entergy New Orleans, the utility company powering the Superdome, quickly went into crises management mode. After all, they’ve had lots of communications experience powering the storm laden Gulf coast and southern states, and most notably having dealt with Hurricane Katrina which devastated New Orleans back in August, 2005. Social media has changed crises communications forever. The old way of assembling the crises team and calling in the PR firm to craft a corporate statement for a newswire service is so yesterday. You need to act swiftly, recognizing the hyper velocity and amplification of social networks! Setting up your social media platforms is easy, but having a social media crises management plan in place, including all possible scenarios and business escalations is much more challenging. Entergy was prepared as they posted updates throughout the week. 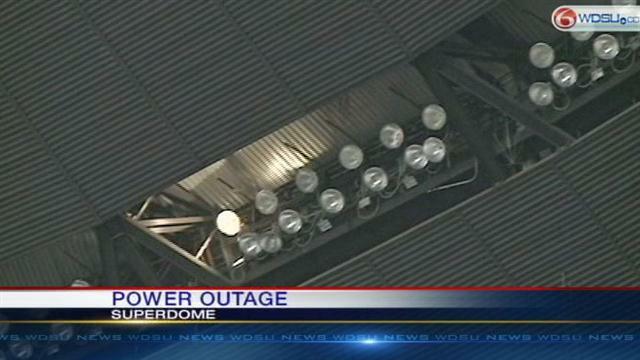 In fact, the first formal statement came from Entergy and the Superdome the following day saying a piece of equipment monitoring electrical load sensed the abnormality and opened a breaker, partially cutting power. The companies also appropriately announced that a third party would be jointly selected for an assessment as they undertake their own root cause analysis. Yes, bringing third parties in is always a good strategy. Crises management first requires good “listening” followed by a tactful approach in understanding the facts and presenting a response in a clear, straightforward manner. No corporate speak here! In fact, you’re going down a slippery slope if you find yourself having to respond repeatedly to the same audience. A company should consider a crises toll-free hotline number and launch a special microsite providing all the needed information in one place, complete with FAQs. A special Facebook page or Twitter handle can be created for enhanced customer service, as well as be used to limit the social dialogue and conversations to one social network. It’s important to let people vent and for companies to be responsive to individuals. Take people off-line if possible for further social visibility containment and quicker problem resolution. “While some further analysis remains, we believe we have identified and remedied the cause of the power outage and regret the interruption that occurred during what was a showcase event for the city and state,” said Charles Rice, president and chief executive officer of Entergy New Orleans. 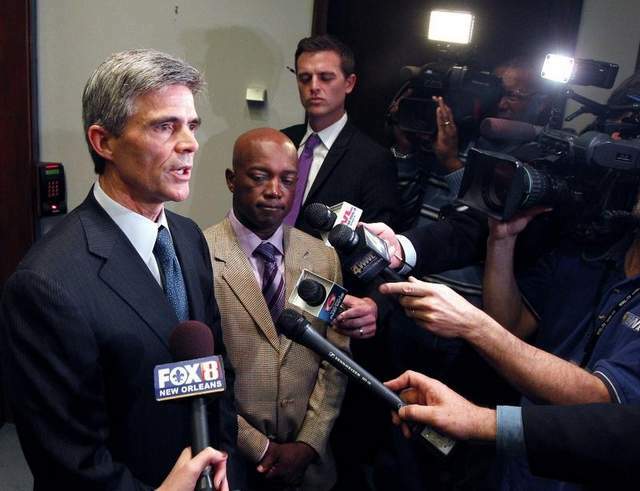 Although Entergy didn’t commit fully to continuing the third party assessment when addressing the media on February 8th, the utility and the manufacturer of the relay were confident their investigation pinpointed the equipment failure point. I haven’t read anything since on this issue, so closure appears to have been achieved. 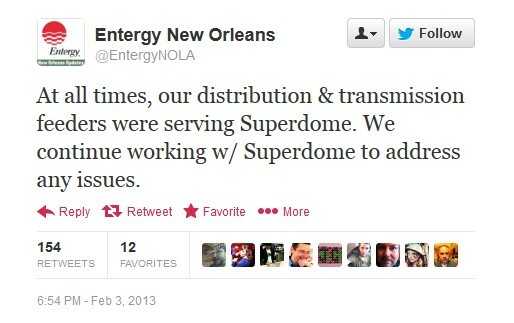 Entergy scored a big social media “touchdown” in their Super Bowl crises management. The playbook was obviously well planned and notably executed. I enjoyed following their communications stream over the week and seeing theory put into practice. I welcome your comments on social media crises management. This entry was posted in Social Media and tagged crises managemet, power outage, social media by irvingfrydman. Bookmark the permalink.